At a friend’s recently opened Roman style restaurant (about which I will write), I enjoyed a “raviolo” – singular of “ravioli” – a single, large filled pasta. His version has an egg yolk in the middle and it is cooked to just the right point that as you cut into the raviolo, the egg yolk pours out. Very dramatic presentation. I decided to try my hand at the concept and make my own raviolo. The end result, which looks pretty enough, is about seven inches in diameter. Truly, I did make “ravioli” as there was one for Tawn and one for me. I just like saying “raviolo”. All things considered, it was a bit of a misadventure due to lack of experience and finesse on my part. But we learn from our mistakes, right? Well, I try to. 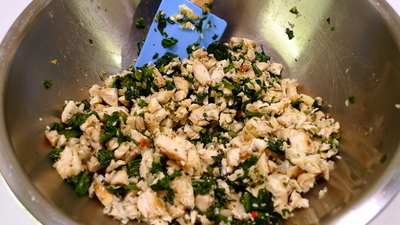 The filling was made of braised spinach and chicken, seasoned liberally with garlic, rosemary, and chili flakes. 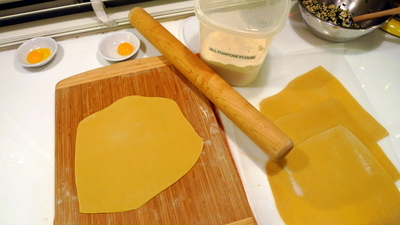 I used Thomas Keller’s seven-yolk pasta dough recipe, which is my go-to recipe for pasta. Instead of pulling out the KitchenAid mixer, I hand rolled the dough. First mistake, as I couldn’t roll it nearly as thin as I should have. That may be because I didn’t let the dough rest long enough after kneading. It was getting late and I wanted dinner on the table before 9:00. 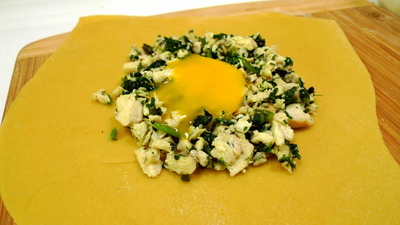 A good-sized portion of the filling was placed in the midst of the dough and an egg yolk was nestled on top. This was my second mistake. I separated the egg yolks at the same time as I separated the egg yolks for the pasta dough. In the intervening hour or so, the yolks formed a slight skin on them, so when I tried to pour them onto the filling, they tore. That ruined the effect of having a nice soft-cooked yolk to cut into! Mama-mia! That’s a meat-balla! Well, actually, just a raviolo. Quite large and a bit of a pain to cut because I had no cutter large enough. Instead, I traced around a saucer with a sharp paring knife. After about six minutes boiling (they were a pain to flip! 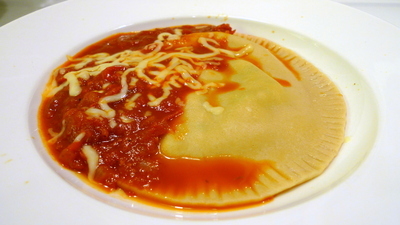 ), the ravioli were ready to serve. I put a simple homemade tomato sauce on top, sprinkling a bit of mozzarella cheese. As you can see, the egg yolk is hardly discernible as it has melted into the filling. 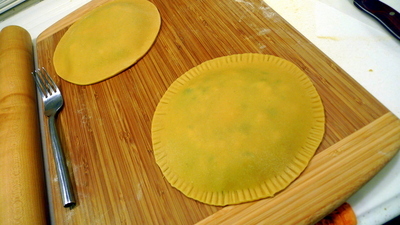 The pasta skin, as I mentioned, was a little thick especially around the edges. All in all, I think it was an okay first attempt and was definitely a learning experience. Next time, I’ll make them a bit smaller, roll out the dough using the pasta machine, and separate the egg yolks at the last minute. The one thing I was pleased with was the filling. While it could have used more spinach (the darn vegetable just shrivels up to nothing when you cook it! ), the flavor was very good – salty, garlicky, and slightly spicy. This entry was posted in Uncategorized and tagged cooking, cuisine, food, homemade, Italian, kitchen, pasta, ravioli, raviolo by christao408. Bookmark the permalink. Oh wow, these look so good. SO hungry in the morning! Is 6 min too long? I’d imagine an egg can cook faster than that. Maybe cook the chicken first then stuff everything in and cook a lot shorter time? Braise is a term I so want to use at times. The sound fits perfectly the image I have. But, a second step is supposed to follow. You can’t braise and then just pllate the meat. That would be searing, I suppose. Oh – I’ve never seen a giant ravioli before! I can’t seem to imagine Italian grandmothers using their Kitchen Aid mixers rather than a rolling pin. I’m of italian descent so I could smell your cooking a mile away. Looks good ! Luckily, I read your post again carefully because my first reaction was that this is a mighty big ravioli. 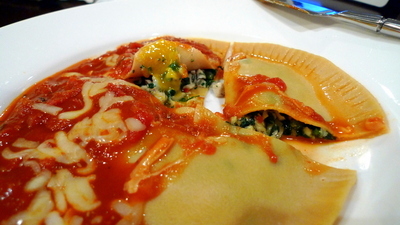 I didn’t even know there was such a thing like a raviolo. Even your flops look good! I am now hungry and it is midnight!! It’s cute. And I’ve learnt a new word: raviolo. I like your enthusiasm and persistence with cooking. Very interesting post! Good job! Never had one before. Yours looks very good and aactually sounds rather interesting to make. Put that on my try list. you’ve done a much better job than if i were to give it a shot myself. That looks yummy and moist. @LostSock21 – With a full egg (instead of just a yolk), 6.5 minutes is the perfect point in time. Would suspect that it should work about the same for just the yolk, but am not sure. @Inciteful – Yes, “braise” really does sound like the action it describes, doesn’t it? @stepaside_loser – Enthusiasm, patience, stubbornness, lack of anything better to do with my time… @Wangium – The edges do look pie-like. @Nostra_Damus – That’s a mark of approval if ever there was one! @rudyhou – Next time you are here, we’ll press you into work in the kitchen. @beowulf222 – Nor did I until I first encountered it at a friend’s restaurant. @ElusiveWords – Or their hand-crank pasta roller. @Grannys_Place – @Fatcat723 – @purpleamethyst76 – @murisopsis – @KevEats – Thanks for your kind words. It was a learning experience but my pasta making technique needs to be radically improved.